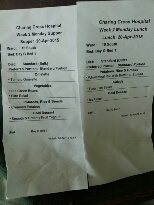 This entry was posted in Food and Drink, Thoughts and tagged food, NHS; by w7. Bookmark the permalink. The only way to survive hospital food is with regular food parcels from outside. Or even whole takeaway meals. On the other hand it might be good to stick with them for drastic weight reduction.